Professional employees are getting ahead by joining the Society of United Professionals. You can, too. If you already work in a Society-represented workplace, click here to sign-up as a member now. The 8,000 Society-represented women and men work in the public, private and not-for-profit sectors. 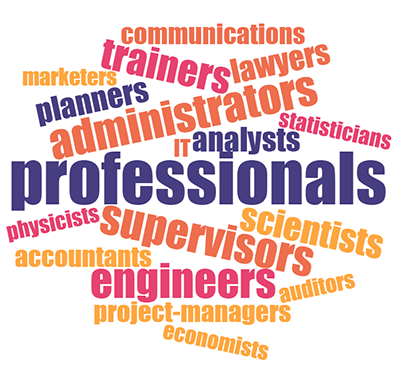 Our members are: engineers, lawyers, scientists, accountants, supervisors, managers, IT professionals, planners, analysts, communications and public relations professionals, economists, project managers, trainers, auditors, statisticians, actuaries, administrators, customer service professionals and marketers. The Society of United Professionals is a union with more than seven decades of experience helping professionals in Ontario build rewarding careers with good working conditions. Do you think you and your colleagues might be interested in becoming Society of United Professionals members? Contact our organizer Michelle LeBlanc at leblancm@thesociety.ca. We keep all inquiries in strict confidence.